Mitavite® Economix® Active™ provides safe, cost effective nutrition for competition and show horses, working stock horses, pleasure horses and ponies and spellers in need of conditioning. Steam extruded to unlock the full nutritional value of its ingredients, Economix® Active™ is fortified with oils rich in Omega 3 to provide cool sustained energy. INGREDIENTS: PRESSURE COOKED AND FULLY STEAM EXTRUDED BARLEY, MOLASSES, VEGETABLE PROTEIN MEALS, VEGETABLE OILS (INCLUDING OMEGA 3 AND OMEGA 9 OILS), SALT, MINERAL SALTS, HEAT STABLE VITAMINS, NATURAL CHELATED PROTEINATES AND NATURAL ENZYMES. Mitavite Breeda® holds pride of place as Australia’s biggest selling and most trusted complete breeding feed. Breeda® has been scientifically formulated to promote optimum, balanced growth and to overcome the problems associated with raising young horses on less than perfect pasture. Critical to the success of Breeda® is the essential amino acid profile and the positive impact that this has on the development of lean muscle, strong tendons and smooth flat bone. This, coupled with the delivery of highly digestible energy, vitamins and minerals in a steam extruded, palatable nugget, assists in limiting peaks in blood sugars often associated with bone developmental problems. INGREDIENTS: PRESSURE COOKED AND FULLY STEAM EXTRUDED CEREAL GRAINS (EXCLUDING OATS). VEGETABLE PROTEIN (INLCUDING CANOLA AND SOYBEAN), LUPINS, MOLASSES VEGETABLE OILS, SALT, MINERAL SALTS, HEAT SOLUBLE VITAMINS NATURAL CHELATED MINERAL PROTEINATES AND NATURAL ENZYMES. 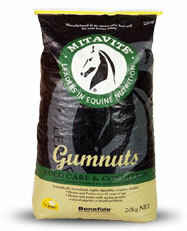 Mitavite Gumnuts® is Australia’s original and most trusted feed especially formulated for aged horses and ponies. Highly nutritious, palatable and safe to feed, Gumnuts® provides a unique balance of vitamins and minerals specifically formulated to address the challenges of old age. Omega 3 oils, antioxidants and essential amino acids are provided in a highly digestible form. Gumnuts® reduces to a soft mash when water is added. INGREDIENTS: CONTAINS GRAINS INCLUDING BARLEY (PRESSURE COOKED AND STEAM EXTRUDED), LEGUMES, VEGETABLE OILS, VEGETABLE PROTEIN MEALS, SALT, ELECTROLYTE MINERAL SALTS, MOLASSES AND ENRICHED WITH OMEGA 3 OILS ADDED MINERALS AND PROTEXIN. Mitavite® Formula 3® is Australia’s No.1 complete, oat free, racing feed. Formula 3® combines the latest scientific advances in equine nutrition and state of the art manufacturing techniques to provide the trainer a fresh, palatable, flexible formulation for simplifying feed room management. Formula 3® may be used with or without the addition of grains.